A couple of weeks ago I had the opportunity to talk to some Yoga Basics students about coming to my classes. Here’s what I told them. During the first year or so of going to yoga classes around town, I fell in love. That overwhelming feeling of I-just-can’t-get-enough kind of love. An obsession, really. At the beginning, I didn’t know its name. I called it “that lying down part at the end”. My secret wish was that each class I took would end with “that lying down part”. 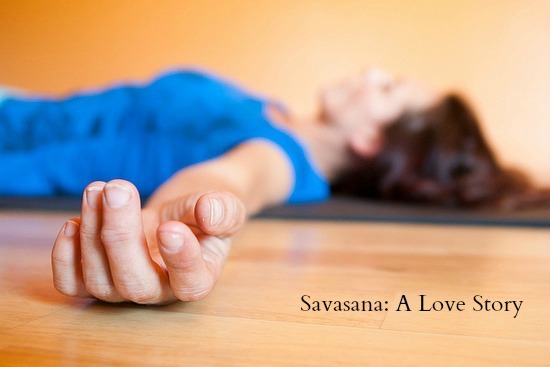 I fell in love with Savasana. I loved that feeling of my body letting go of tension, releasing the urge to work, and falling into relaxation and rest at the end of class. Even if we only were there for a few minutes, that was the part I liked the most. I felt its power of rest like nothing I’d ever experienced, except maybe for an actual nap. After each class, my mind felt calmer, my body relaxed and for a brief time, I felt peaceful. For a super Type-A, pitta-deranged, smart Alec with amazing perfectionist tendencies, peaceful was something I’d never felt before. So I kept going back, week after week, hoping that we would end with “that lying down part”. It surprises me now – a decade plus past my first class – that not one time, in any class I took that first year, did any teacher mention that every class ends with “that lying down part”. Imagine my delight when I finally asked someone and they explained that EVERY yoga class ends that way! To this day I love Savasana. In fact, I’ve dedicated my yoga teaching to the lying down part! We pretty much do that the whole time in my classes. And while, yes, it can be hard to do – it is worth it. Interested in starting a love affair with “that lying down part”? Check out my class schedule and come rest with me. What yoga pose would you write a love story about? This entry was posted in A Yoga Story and tagged It's All Yoga, meditation, relaxation, relaxing, Robert Bejil Photography, Sacramento, savasana, taking a break, yoga basics, yoga class by Teacher Goes Back to School. Bookmark the permalink. I do love savasana and sometime I need to tell you the funniest story about taking BF to a yoga class. My love story would be to pigeon. Love, love, love it (while it hurts so good).